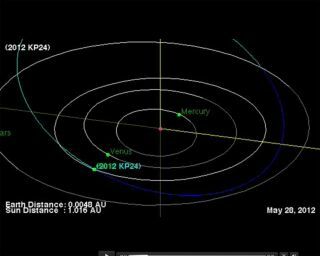 The asteroid 2012 KP24 flew past Earth on May 28, 2012. While the space rock passed within the moon's orbit, it did not pose any danger to the planet. Two small asteroids zipped close by Earth in back-to-back flybys of the planet Monday (May 28) and today. While both space rocks came well within the moon's orbit, they posed no danger to our planet, NASA scientists say. The newfound asteroid 2012 KP24 zoomed by Earth Monday (May 28), coming within 32,000 miles (51,000 kilometers) on its closest approach, according to astronomers at NASA's Asteroid Watch at the agency's Jet Propulsion Laboratory in Pasadena, Calif.
"We'll have a close but very safe pass of asteroid 2012 KP24 May 28," scientists with NASA's Asteroid Watch program assured via Twitter. Asteroid Watch is part of the Near-Earth Object Office at NASA's Jet Propulsion Laboratory in Pasadena, Calif. The NEO office oversees the agency's efforts to detect, track and characterize potentially dangerous asteroids or comets that could zoom close to Earth. The recently discovered asteroid 2012 KP24 measures approximately 69 feet (21 meters) across and did not pose any threat to Earth during its flyby, NASA scientists said. But this space rock is not the only one that paid a close visit to our planet this week. Another small asteroid, called 2012 KT42, flew past Earth early today (May 29). The asteroid came within 8,950 miles (14,400 km) on its closest approach, which easily fits between the Earth and moon's orbit. For comparison, the moon typically circles Earth at a distance of about 240,000 miles (386,000 km). While asteroid 2012 KT42 was only discovered yesterday, the space rock did not pose any impact threat Earth when it made its closest approach at 3:07 a.m. EDT (0707 GMT), NASA scientists said. The small space rock is only about 16 feet (5 m) wide, which means it would not pack much of a punch even if it did hit the planet, according to astronomer Tony Phillips on his website Spaceweather.com, which monitors major space weather and skywatching events. "Even if it did hit, this space rock is too small to cause significant damage," Phillips wrote. "It would likely disintegrate almost entirely in the atmosphere, peppering the ground below with relatively small meteorites." Astronomers with NASA and other organizations regularly scan the skies in search of potentially dangerous near-Earth objects. Experts estimate that space rocks that measure about 460 feet (140 m) across or larger could cause widespread devastation if they impact the planet. A much larger asteroid, however, would be required to cause destruction on a global scale.